Pin Type Coupler Without Wing Nut. 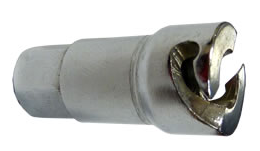 Pin Type Couplers Provide a Quick Leakproof Connection with Pin Type Fittings. Thread: 1/8" NPTF(f) / Made of Zinc Plated Corrosion Resistant Steel.